A new study presented a couple of weeks ago at the American Academy of Dermatology's 74th Annual Meeting in Washington show that black women are more prone to hair loss.The also found that even though we are prone to hair loss, we are less likely to seek professional help about the problem. Board-certified dermatologist Yolanda M. Lenzy, MD, FAAD, clinical associate, University of Connecticut, Farmington, Conn. stated that the number one case for this in Black women is a condition called central centrifugal cicatricial alopecia (CCCA). This disorder causes inflammation and destruction of hair follicles that leads to scarring and permanent hair loss. The braids, weaves and relaxers are big culprits to this problem. Yes, our styling products whether natural or relaxed are to blame. 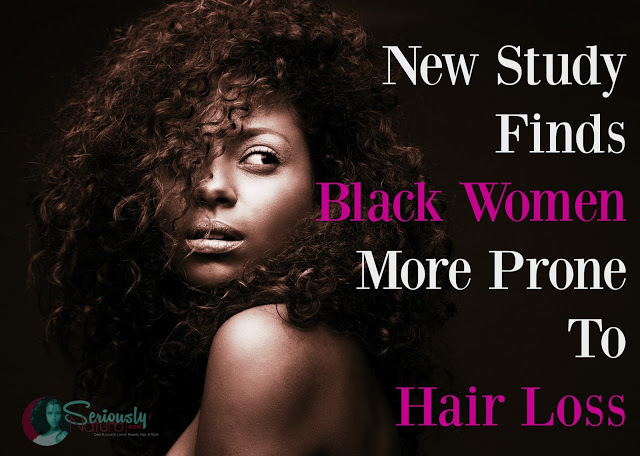 “Women who use these styling practices tend to use them repeatedly, and long-term repeated use can result in hair loss,” says Lenzy, who worked with the Black Women’s Health Study at Boston University to survey nearly 6,000 African-American women about hair loss. While only 47% in the study claimed to have had hair loss at the top of the scalp, more than 80% had not consulted a doctor about their hair loss problems although steroid creams and antibiotics greatly help the regrowth of hair in those areas. Visiting a dermatologist or a trichologist when suffering from hair thinning or hair loss needs to be your first course of action. Also know that styling practices may be the main reason for these types of hair losses in Black women and that they can be corrected. Dr. Lenzy suggests that avoiding tight hair styles that put tension on the follicles, like braids and weaves, and limiting their use of chemical relaxers can great manage or reduce the risk for hair loss.